About: Contactless credit cards are vulnerable to skimming attacks that can result in your card data being compromised. an ID thief can steal the information with a readily available skimmer and remotely access personal information contained on the credit card directly through wallets. 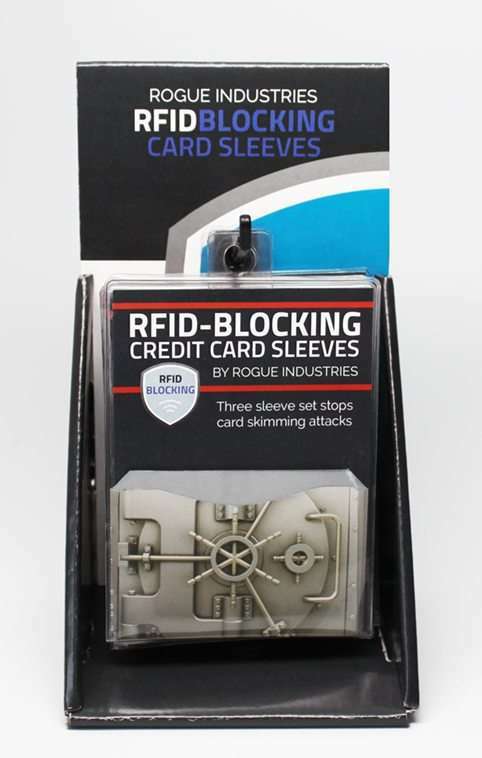 Our patented RFID-Blocking Credit Card Sleeves prevent unauthorized access to credit cards by creating a metallic shield that blocks skimming attacks. The material we use, RFID-blocking WalletGuard, is laboratory tested and FIPS 201 approved. The paper is indeed both very thin and flexible—but it is also an amazing piece of technology. Sandwiched between the inner and outer layers of paper is the nano thin layer of metal—and it is precisely this metal layer which provides the barrier for RFID protection. This combination of paper and metal bonded together creates an exceedingly durable sleeve. The sleeves are designed to only hold one credit card per sleeve. It does not matter how you insert a credit card into the sleeve. The entire sleeve is constructed with a 3-layered material (the inside layer is a metal coating). This envelopes and protects the entire card. Product: Three designs of patented top-loading credit card sleeves (Platinum Vault, Purple Paisley, assorted Vintage Travel). Each prepackaged hang-sell contains three sleeves. A display is available at no charge and will hold up to 24 hang-sell packages. Minimum 24 hang-sells per order. Terms: Prepayment via check, credit card, wire transfer.